Bush called Iraq an ally of growing strength in the fight against terror. WASHINGTON (CNN) -- President Bush acknowledged deep divisions and difficult progress in Iraq Sunday night, but said U.S. forces were making "steady gains" in the nearly 3-year-old war and urged Americans not to "give in to despair." 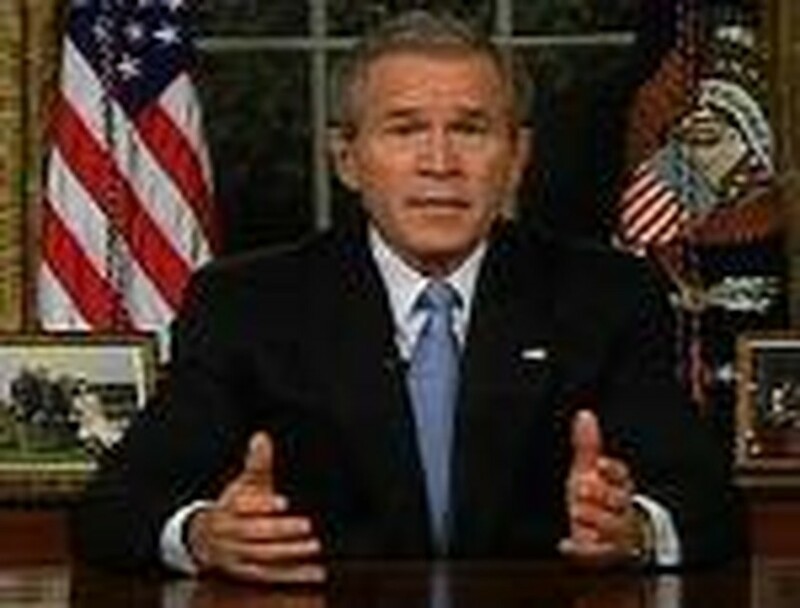 In his first Oval Office address since launching the invasion of Iraq in March 2003, Bush called Thursday's balloting for a permanent Iraqi government "a landmark day in the history of liberty." But he also warned, "There is more testing and sacrifice before us." "For every scene of destruction in Iraq, there are more scenes of rebuilding and hope," he said. "For every life lost, there are countless more lives reclaimed. And for every terrorist working to stop freedom in Iraq, there are many more Iraqis and Americans working to defeat them. More than 2,100 U.S. troops have died in Iraq since the invasion, which Bush and top aides argued was necessary to strip Iraq of chemical and biological weapons and efforts to develop a nuclear bomb. No such weapons were found once the government of Saddam Hussein collapsed in April 2003. 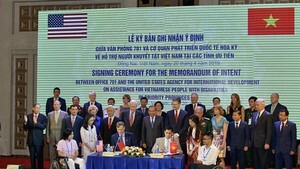 Bush acknowledged the doubts of many Americans who opposed the invasion, but said the United States now faces just two outcomes: "victory or defeat." "I do not expect you to support everything I do, but tonight I have a request: Do not give in to despair, and do not give up on this fight for freedom," he said. Bush said he disagrees with critics who have concluded the war, which the White House has said is costing about $6 billion per month, is "not worth another dime or another day." Bush said the war has been "more difficult than we expected," with reconstruction work and the establishment of a new Iraqi military and police force taking longer than hoped. But he said a quick withdrawal from Iraq, as some of his critics have advocated, would damage U.S. credibility just as insurgents begin to feel "a tightening noose" of U.S. and Iraqi forces. "Behind the images of chaos that terrorists create for the cameras, we are making steady gains with a clear objective in view," he said. Bush said the United States could not withdraw its troops from Iraq "before our work is done." "We would abandon our Iraqi friends -- and signal to the world that America cannot be trusted to keep its word," he said. "We would hand Iraq over to enemies who have pledged to attack us." He held out the prospect that some U.S. troops might be able to come home before long as Iraq's fledgling government and military take on more responsibilities. "As these achievements come, it should require fewer American troops to accomplish our mission," he said. Sen. Lindsey Graham, a South Carolina Republican, said he was "optimistic" about the situation in Iraq after the president's speech. "I congratulate the president on being honest and candid about past problems and telling us how hard it's going to be but how necessary it will be to get it right," said Graham, who was in Iraq last week to monitor the election. He said other problems need to be addressed in Iraq, including the influence of sectarian and political militias in government agencies like the Interior Ministry, which oversees the police. "You cannot have a democracy where you have militias," he said. But he added, "There's hope now where there was no hope before." Rep. Ellen Tauscher, a California Democrat, said Bush's jabs at "defeatists" made the address "a typical kind of my-way-or-the-highway speech." "I think that's really unnecessary, and I think it's really important for the president to be honest with the American people that the hard slog is far from over," she said. Sen. Russ Feingold, one of the few senators to call for a quick withdrawal from Iraq, said the United States must shift its focus back to terrorist networks like al Qaeda. "The president needs to realize that his misguided, Iraq-centric policies are draining our military and intelligence capabilities and are undermining our efforts to combat al Qaeda and its allies," the Wisconsin Democrat said in a written statement. But Rep. Tom DeLay, a Texas Republican who had to give up his post as House majority leader after his indictment on campaign finance charges in Texas, praised Bush for a "clear, specific and resolute" speech. House Speaker Dennis Hastert of Illinois said House Republicans would stand firm against any calls for withdrawal "despite attempts by some Democrats to play politics with this war and America's national security." Senate Minority Leader Harry Reid praised Bush's "increased candor" about the war, but said "too much of the substance remains the same." "The American people have still not heard what benchmarks we must meet along the way to know that progress is being made and that our brave troops can begin to come home," said the Nevada Democrat.